Incredibly rare full colour art by the great RON SMITH from 2000ad prog 117, 16 June 1979. 2000ad had a brief period between Progs 113 - 126 where they got to print on higher grade stock and with Offset printing so could have fully painted covers for the first time. This was Ron Smith's full colour Judge Dredd cover. Most covers of this period were drawn B&W, then coloured as seperations on an editorial copy. This however is fully painted art from 2000ad's Golden age!. Art is on heavy Dorchester illustration board, 34 x 44 cm. Lettering on art is Tom Frame's original. 2000ad Title and date are repro on acetate, as Ron thtough out the acetates as he disliked them! 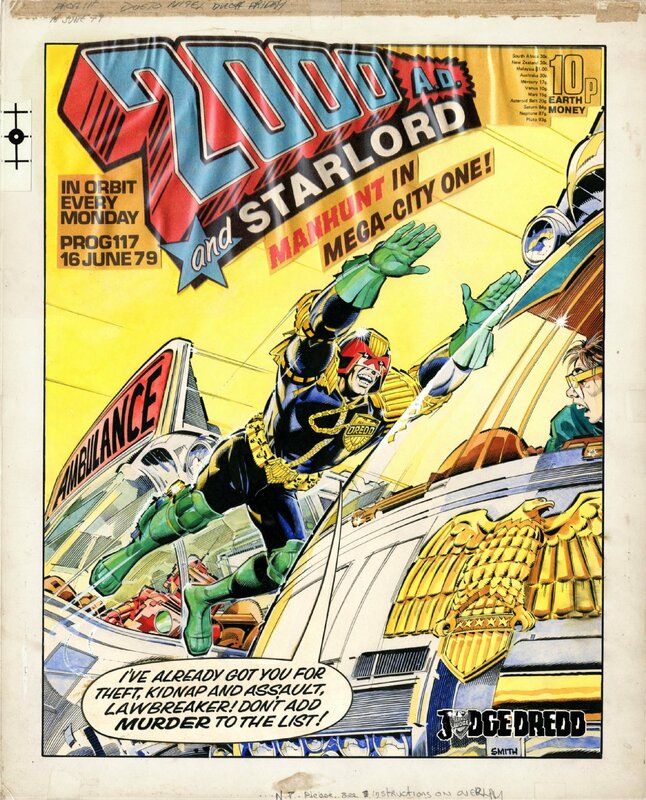 A rare opportunity to have an early Judge Dredd cover and a piece of 2000ad history!